There is a phenomenon known as “breakfast for dinner” whereby seemingly normal people choose to ingest breakfast foods, namely French toast, pancakes and bacon for dinner. Why they would want to do this, I have no idea. I may have mentioned it before, but standard American breakfast foods (with the exception of toast, which may be my favorite food) are not my idea of a good time. I can blame this particular quirk on my mother, who took a firm stand against eating sweet foods for breakfast, which led to a deprived childhood lacking in things like Cocoa Krispies, pancakes, french toast casserole, blueberry muffins and donuts eaten before noon. My mother was convinced that these foods would give me low blood sugar and lead to headaches and feeling unwell, and unfortunately, the few times she relented on this policy, she was proven correct. Now, even as an adult, I look askance at things like pancakes, and rarely eat them, so the idea of replacing a normal meal that ordinarily provides lots of not-sweet nutrition with stacks of carbs just strikes me as plain odd. I do, however, make an exception for omelets. Maybe it’s the French in me, but I really think there’s no bad time for an omelet. They’re infinitely adaptable, are an excellent way to use whatever’s in your fridge, and go perfectly with a glass of wine. Now that is what I call dinner. 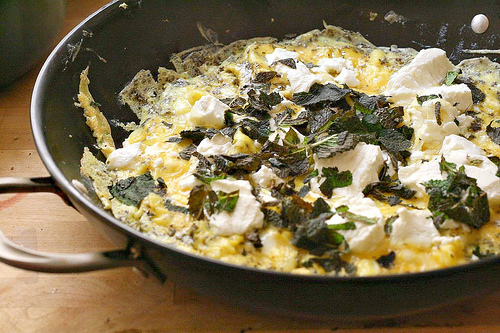 This particular omelet is one of my favorites — the recipe is from Nigella Lawson, who calls it a Corsican omelet (which immediately evokes Mediterranean beaches and terraces of olive trees, making the omelet that much better). It’s just eggs, flavored with herbs, and stuffed with mint and goat cheese, which is a great combination, particularly for summer. If I’m making an omelet for myself, I usually use a nonstick skillet, since I like the insides a little runny, but if I’m serving others, I like anodized aluminum — it’s still relatively nonstick, but can go in the oven to finish the top. I tend to plan for 2 eggs per person, depending on what else is on offer. My mother taught me to make an omelet this way — beat the eggs with a little water to lighten them, and add salt and pepper and some herbes de Provence. Melt butter in your pan, and swirl to coat well. When the butter has stopped sizzling add the eggs, and leave untouched for about 30 seconds to set. When the eggs have begun to set, use a silicone spatula (that’s my addition — my mother used a butter knife) and lift/push the edges of the omelet in towards the center of the pan, letting the liquid egg swirl under to the sides of the pan. Then let set, and repeat 2-3 times, or until you run out of liquid egg that’s willing to fill the spaces. The interior should still be loose — there’s nothig worse than a dry omelet. Add the filling, and either cook a little longer on the stovetop or finish under a broiler for a few seconds, just until the egg is set. 1 small bunch fresh mint, chopped. Beat eggs together with herbs and a few tablespoons of water, and season. Melt butter in a nonstick pan. When it has finished sizzling, add eggs and cook as above. Crumble in the cheese and scatter the mint. Run under a broiler if you like your eggs more set -- otherwise, fold in half and serve in wedges. I am deep in the throes of a love affair with eggs for dinner, born of laziness, but also of the infinite possibilities for fillings. I’ll do anything – scrambles, frittatas, omelets, eggs en cocotte – whatever is left in the fridge gets mixed with eggs and served up with toast (one of my all-time favorite foods, too). Can’t wait to try this, and love your mom’s method. Eggs and cheese. What a great combo! I love eggs for dinner. Growing up my mom would make a steam egg omelete for dinner. She fills it with pork and drizzle it with soy sauce when it’s done. Your dinner looks lovely. I bet this dish would be great for brunch as well. This is indeed a speciality in Corsica. You’ll find it on menus there – perhaps as a light lunch, or as an entree to a more elaborate meal. It’s made with brocciu, which is a fresh Corsican cheese, just like you’ve called for here. Love your photos of this – especially the plated one. Great omelette making tips too. Thanks. I don’t like sweet things for breakfast either. My best friend loves pancakes so I occasionally make them for him, and I have a great recipe for them, but I don’t eat them. I only have two exceptions – Marion Cunningham’s Raised Waffles and Dutch Babies – both with maple syrup on them (tapped from trees on my friend’s farm). But even those I have to eat way later in the day than breakfast time, and I only eat them about three times a year. My favorite breakfast ever was the day I ate a small bowl of left-over shrimp creole! But this looks delicious. When I make omelets for dinner my husband cheers (although my kids make faces). I use herbs from my garden, whatever’s at hand, and either goat or feta cheese. Thanks for reminding me that I should make this for dinner TONIGHT! It’s almost midnight, I’m starving, you posted fantasy omelet pics *and* eggs await in the fridge. Kate, thank you for solving this late-night equation. love the concept! great tips on omelette making.